J.K. Adams Turnabout Cutting & Carving Board-This reversible carver is the most popular board in the J. K. Adams line. 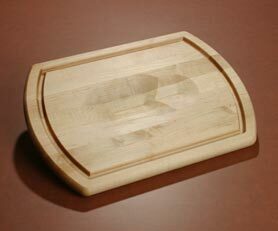 With features on both sides the turnabout cutting board is a versatile kitchen accessory. One side features a uniquely shaped holder that cradles poultry & roasts while slicing. The reverse side has a large flat cutting surface surrounded by a juice groove. Made in the U.S.A.of the finest Northeastern kiln dried lumber combining both form & function. Made of maple with an oil finish. J.K. Adams Turnabout Cutting & Carving Board.